We have three kayaks and 4 canoes. There is a river that runs through our lake. You can put in up river and get to the lake house. There is a 9 hole golf course on the lake and its about a one mile drive. Beautiful View Of Lake Barker. Had a nice relaxing stay on the lake. The house was nice and clean. WiFi and cable were a big plus on rainy days. The fishing was good. Caught Perch and blugill mainly. One bass and a red tail sucker which I threw back.Kayak and canoe and other boats there if you wish to take an adventure on the lake. The kitchen had everything you could possibly need to cook a meal. We had a wonderful time. Great place to stay! Close to the lake for kids to swim. We were close to atv trails and the lake to go fishing and tubing. We had a great time and would come back again. We loved this house. It was equipped with everything we needed. Our dog enjoyed the lake so much. It was a very quiet neighborhood. Was nice to have the wifi so we could check the weather. We will definitely go back. Our group really enjoyed staying on Barker Lake. It had plenty of space for us to relax when we weren't out skiing. The kitchen is a great size and worked well to cook up big meals. Kimberly was a gracious and accommodating host. Everyone was comfortable sleeping and the bunkhouse worked out really well for us. Hope to make it back that way soon. Really enjoyed the stay. The cabin was clean and loved how close to the water it is. Having campfire wood provided was really nice as there is a great spot for campfires right next to the water. This property is beautiful. 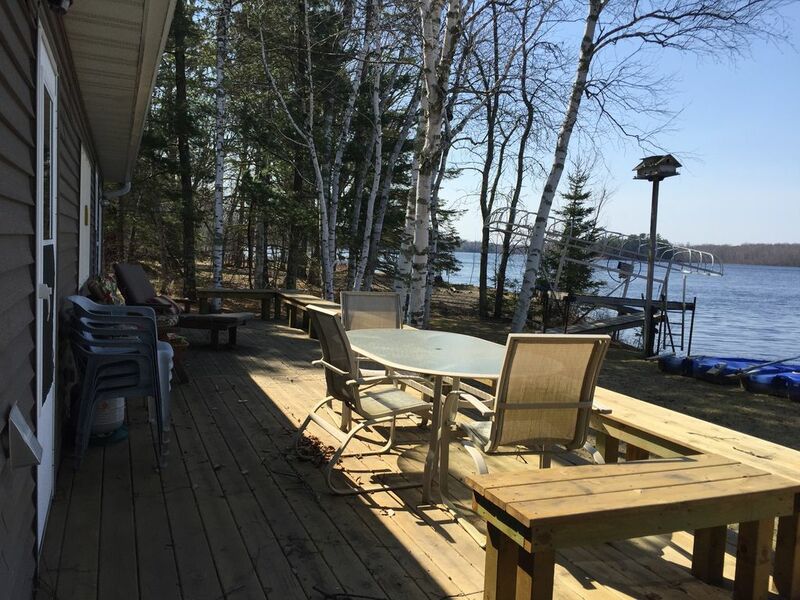 The layout is perfect for a couple families to enjoy the magic of the north! The owner really cares about the people who stay here, and it shows! From the sweet dock that makes kayak launches simple, to the board games stashed away in the toy chest; this place is great! We will be back.